When Wally reveals he has reoccurring dreams of being Kid Flash, Barry is worried Doctor Alchemy has chosen Wally as his next target. Meanwhile, a shadow meta attacks the city, and Caitlin tells Cisco about her frost powers. Since Wally arrived during season two, he has grown a lot. I didn't like him at first, but now I do. And I'm glad they're finally addressing the Kid Flash thread. In Flashpoint, Wally as Kid Flash is adorable, which is why it's hard to watch him in the current timeline. He just wants to help people and have powers; I feel so bad. But he showed a lot of strength in this episode. Yes, he did get angry, but he also was willing to give up what he wanted to stop Alchemy. That is already heroic. He showed a lot of strength in this episode... until the end. I still don't know what picking up that rock will mean, but I'm excited to find out. As always, HR continues to be hilarious. His little quirks are perfect, and I love all the references to his earth, like Gorilla Grodd or the facial transmogrification. He was so excited to watch the movie; it was great. I'm glad Caitlin finally told Cisco and the rest of the team about her frost powers. While I know she's scared of what she'll become, I wish she would have told them sooner so they could've helped her. I also adore her friendship with Cisco; it was heart warming to see him comfort her. These two finally had their date, and they were adorable. I ship it so much. Please don't let anything happen to her. Iris punching Wally in the face to stop him was the best moment of the episode. You go, girl! The shade meta was kind of lame. I thought it was going to be connected to Doctor Alchemy (like a distraction while he tried to get to Wally), but it was simply just another meta angry at Central City for no specific reason. While the concept was interesting--especially when Barry fought him--the resolution didn't carry. We didn't find out why he was attacking people. They just captured him, and it was over. It was disappointing. I still don't like Doctor Alchemy, even if they "stopped" him. (Did they? I couldn't really tell.) I guess my biggest thing is we still don't know who he is. Is he someone important? How did he get his powers? Does he even have powers? We didn't get any of the answers. He is intriguing, but I'd like to know more now that they stopped him. The ending was kind of chaotic. I couldn't tell what was happening. They caught Doctor Alchemy, Wally was trapped in a glowing orange rock shell thing (??? ), and Ultron Savitar the God of Speed appeared? Where did he come from? What does he have to do with Doctor Alchemy? What in the MULTI-VERSE DOES THIS MEAN? While the ending was crazy and confusing, it was still thrilling. I'm super pumped for what's next in the season. 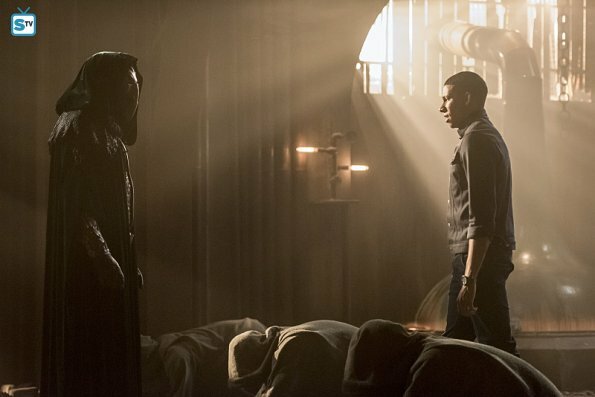 I couldn't imagine Doctor Alchemy would be the biggest foe this season, so I'm intrigued that they brought in another speedster (thankfully not one connected to Reverse-Flash). They've got a lot building up, which will hopefully prove to be another great season arc. What did you think of "Shade"? What do you think the new developments will mean for the show?